Filing your taxes is an important spring ritual in Canada. Even though graduate student scholarships are generally tax-free, it’s still important to file your taxes so that you can report your tuition paid, which creates a credit you can carry-forward until you’re working and have income to count them against. Your tax return must be filed by April 30th of each year if you owe taxes. There are many programs that make filing a simple tax return a snap, some of them available for free. For most students and fellows, you will receive a set of tax slips from UHN and/or UofT (a T4/T4A, T2202A), with amounts in various boxes coded by numbers. You simply copy those amounts into the corresponding boxes in your tax program and submit online. In 2015 the Canada Revenue Agency introduced “auto-fill” which may make filing your taxes for simple situations even easier. If you have income from other jobs or other complicating factors (such as investments outside your TFSA), you may need to do some more research on preparing your return. The Canada Revenue Agency has information on preparing your return here. There are several free programs available including SimpleTax and StudioTax, TurboTax Free and H&R Block’s program. Some paid services provide free offerings for post-secondary students including UFile. A full list of tax software certified by the CRA is available here. In late February of each year, UHN Human Resources will make T4A slips available to students through the employee self-service portal (link only accessible within the UHN network). If you need help accessing your slip, call the UHN Payroll Helpline at 14-6363. If your stipend/scholarship is paid through UofT, you will need to contact your department for information on how to obtain your T4A slip. UofT students can obtain their T2202A slip (information for your tuition credit) through the ROSI system. In late February of each year, UHN Human Resources will make T4 or T4A slips available to postdoctoral fellows through the employee self-service portal (link only accessible within the UHN network). If you need help accessing your slip, call the UHN Payroll Helpline at 14-6363. The status and tax treatment of postdoctoral fellows’ pay has changed in recent years and you should expect that your stipend/salary is fully taxable. If UHN/UofT has not been withholding tax on each of your paystubs, you should expect to owe taxes after filing. Calculators are available online to estimate how much tax you may owe, such as this one from SimpleTax or this one from TaxTips—if you do not have tax withheld from each paycheque, be sure to set some savings aside so that you are ready for the tax bill in the spring. If you have a part-time business as a freelancer, have a look at this guide to Canadian taxes for freelancers. Toronto has an extensive public transportation network of busses, streetcars, subways, and regional commuter trains. The Toronto Transit Commission (TTC) provides public transportation within the City of Toronto. If you’re a frequent user of the TTC you may want to sign up for a monthly pass (called a “Metropass”)—graduate students can purchase a metropass at a special post-secondary rate, but will require a TTC-issued student ID card. You can save money on the cost of transit by signing up for a TTC VIP Metropass (link only accessibly within the UHN network), which will have the cost automatically taken from your paycheque. If you rely on the TTC for daily transportation, you may want to sign up for e-Alerts. Regional transportation around Toronto includes the GO commuter train and bus service, Mississauga Transit, York Region Transit, and Durham Region Transit. A Presto card can be used to pay for fares on many TTC routes, GO routes, and other regional transit provider routes. Health and Dental Benefits for students enrolled at UofT are administered by the University of Toronto Graduate Student Union. Students seeking health and counselling services can also access UofT’s Health and Wellness Centre. Students can use UofT resources for fitness, including Hart House, the Athletic Centre, Goldring Centre, and Varsity Centre. UHN provides PDFs with health and dental benefits if they are on UHN payroll. If you are externally funded and not on UHN payroll, the ORT has negotiated special rates through SunLife for individual benefit plans. Contact the ORT to obtain an application form. Postdoctoral fellows will have to find their own family physicians—the Ontario Ministry of Health and Long-Term Care has a website with information and tools to help find a physician or local health team. PDFs who are on the UHN payroll also have access to the Employee Assistance Program(EAP), a program designed to help individuals cope with personal/work-related pressures stress. For more information regarding this program and other services available to assist with stress please click here. The Ontario Dental Association maintains a website to help Ontario residents find a dentist. The Patient Clinic at the Faculty of Dentistry is a full service facility providing dental treatments by student dentists under the supervision of qualified dentists, successfully treating thousands of patients every year. All trainees must have their immunizations up-to-date before working at UHN, particularly measles/mumps/rubella, tetanus/diphtheria/pertussis, hepatitis B, and varicella. You will also have to have a tuberculosis (TB) skin test. UHN Occupational Health and Safety will help collect your records during onboarding, and can provide any needed vaccinations; your primary care physician should be able to provide a copy of your vaccination records. Note that visiting fellows and students (not paid through UHN) are expected to receive their vaccinations at their home institute, university, or physician. Healthy Living Tips for Trainees. Iris Kulbatski. May 2013. Trainees should contact the Occupational Health and Safety clinic at their site for more information on immunizations, health, and wellness. For TRI clinic hours and locations, please call the number above. In Toronto, long waiting lists and limited spots for child care are unfortunately a common occurrence. You should add your child to the waiting lists for day care as soon as possible if you will need it. The City of Toronto offers a child care locator on its site. For school-aged children, see the Toronto District School Board site for information on registering for school. Typically, Canadian banks with bricks & mortar branch networks charge monthly fees for chequing accounts, however most have free options available for full-time students. Every one of these options offers a variety of services in addition to chequing and savings accounts such as credit cards, investment products, retirement accounts (e.g. TFSA, RRSP), lines of credit, and more. You do not need to get your credit card or investment product from the same bank that provides your chequing account, though you may find it more convenient. In addition to the major banks, there are many credit unions around Toronto. Alterna and Meridian have locations close to UHN. If you require a loan for your graduate studies and you are a Canadian citizen, you may be eligible to borrow from OSAP. The University of Toronto has rental listings that are exclusive to students, but also provides general information and links on its housing services site. Sites with rental listings include Craigslist, ViewIt, Kijiji, and MLS. Navut provides information on Toronto neighbourhoods to help newcomers to the city find a locale that will suit them. If you need to connect utilities, you can contact the following major service providers. Be prepared to provide two pieces of ID plus your engagement letter (proof of “employment” status). Be aware of door-to-door marketers in Toronto: they do not have the right to “examine” your bill, hot water heater, or furnace. The major natural gas and electricity providers in Toronto are regulated, and smaller companies offering fixed-rate services generally will not save you money. Many renters in Canada purchase tenant’s insurance to insure their belongings and to cover them for liability. Tenant’s insurance can be purchased through a bank or an insurance broker. There’s a lot more to Toronto than its great research hospitals and laboratories. And finally, Toronto’s public library system has an extensive collection of books and movies to borrow, and also offers educational seminars, book clubs, book readings, and more! At UHN, students and fellows have exceptional track records at obtaining competitive external awards and fellowships to support their training. All research trainees are encouraged to apply for scholarships and fellowships for which they are eligible. Trainees should check the links below for information on specific opportunities and annual deadlines, and students should additionally explore funding opportunities in their sponsoring academic departments. Krembil Postdoctoral Fellowship Award—Next deadline, expected Fall 2018. TGRI Postdoctoral Fellowship Award—Applications are now closed. Next round will be announced Spring 2019. TRI Fellowships- No applications are currently being accepted, TRI is honouring its committment to all past winners. OSOTF award for neuroscience graduate students – Next Deadline, expected June 2019. The ORT Conference Travel Award Program – Next Deadline, March 9, 2019. For more info, click here. TRI Director’s Innovation Award—Next deadline: TBA. TRI Mark Rochon Leadership Award for Graduate Students—No Applications are currently being accepted. Please check back Summer 2019. Joel Verwegen Award for Undergraduate Students—Next Deadline, TBA, expected Fall 2018. Ted Rogers Centre for Heart Research Education Award—Find out more. Mitacs Accelerate. This program enables graduate students to apply their knowledge and skills to business-related research challenges. Applications are accepted at any time throughout the year. Click here for details. Canadian Cancer Society Research Institute—Travel Awards. These awards help to offset the costs associated with making a scientific presentation at a conference, symposium or professional meeting. There are three competitions per year: January, May and September. Click here for details. Parkinson Society Canada—Graduate Student Award. This award was established to encourage promising young scientists to enter the field of Parkinson’s research and to invest in research training that offers promise for future work in the area of Parkinson’s disease. PSC invites fellowship applications from applicants committed to conducting biomedical research in areas relevant to the cure, cause, prevention, improved treatment and/or understanding of Parkinson’s disease. The competition typically opens in late November for applications due in February. Click here for more information. The Kidney Foundation of Canada—Allied Health Scholarships and Allied Health Doctoral Scholarships. These awards are targeted at allied health professionals (nurses, psychologists, social workers, technicians, etc.) who are pursuing full-time graduate studies with a focus on nephrology or organ donation. Click here for details. Lady Tata Memorial Trust—PhD Studentship. An international competition for graduate students focusing on leukemia research. Click here for details. Weston Brain Institute International Fellowships in Neuroscience. For PhD students who are doing translational research on neurodegenerative disease(s) of aging to apply to this prestigious award. Click here for details. The Arthritis Society Research and Training Award. Scholarship for those working within the field of arthritis research. Click here for details. Novartis Oncology Young Canadian Investigator Awards. Young researchers (graduate students, postdoctoral fellows) in oncology attending the ASCO annual meeting can apply. Click here for details. AllerGen International Trainee Research Visit Program. Funding for trainees to spend from six weeks to six months outside of Canada working on research projects with international investigators. Research visits must contribute to the advancement of the objectives and intended outcomes of an AllerGen-funded research project and provide for a unique training opportunity not available in Canada. In turn, AllerGen encourages visiting research students from outside Canada to work with AllerGen Investigators on AllerGen-funded research projects. See link for details. CIHR Doctoral Research Award. The CIHR Doctoral Research Awards provide $30,000 per year as a stipend as well as a research allowance. Click here for more information. Multiple Sclerosis Society – Studentship Awards. This award provides opportunities for research training and broadening the scientific understanding of MS for students currently enrolled in a Master’s & PhD level program. Click here for more information. NSERC Canada Graduate Scholarships—Michael Smith Foreign Study Supplements (CGS-MSFSS). This program for students who already hold CGS awards supports the pursuit of exceptional research experiences abroad. Click here for details. NSERC Canada Graduate Scholarships—Doctoral Program. This program supports graduate students in natural sciences and engineering. You must decide whether your research best fits CIHR or NSERC and apply to only one of these competitions. Click here for details. Cystic Fibrosis Foundation: Studentship Awards. Click here for details. Vanier Canada Graduate Scholarship. Funding is for 3 years. Doctoral students are eligible to apply. Click here for details. Alzheimer Society of Canada – Alzheimer Society Research Program Awards. Doctoral awards provide an opportunity for promising PhD students to learn about how to become future investigators in the field of Alzheimer’s disease and other dementias. Funding is for 3 years. Applicants must be within the first 18 months of their PhD program. Click here for details. The Canada Graduate Scholarships—Master’s Program. Click here for details. Mitacs Accelerate. This program enables PDFs to apply their knowledge and skills to business-related research challenges. Applications are accepted at any time throughout the year. Click here for details. Parkinson Society Canada—Basic Research Fellowship. This award was established to encourage promising young scientists (with an MD or PhD) to enter the field of Parkinson’s research and to invest in research training that offers promise for future work in the area of Parkinson’s disease. PSC invites fellowship applications from applicants committed to conducting biomedical research in areas relevant to the cure, cause, prevention, improved treatment and/or understanding of Parkinson’s disease. The competition typically opens in late November for applications due in February. Click here for more information. EMBO Long-term Fellows. Postdoctoral fellows who earned their PhD in and are citizens of an EMBC Member State can apply for support to study at UHN, with applications accepted in February and August. Click here for more information. KRESCENT / CIHR Postdoctoral Fellowship. This program is offering funding to young investigators who would like to initiate and/or continue training in kidney research. Click here for details. Mitacs Elevate. A two-year training program for postdoctoral fellows, in which participants undertake an industrially relevant research project in partnership with a private-sector partner. Click here for details. AllerGen Emerging Clinician-Scientist Research Fellowship. This fellowship is to enable Canadian Allergists and Clinical Immunologists to pursue allergy, asthma and/or anaphylaxis academic research training immediately following their Clinical Immunology and Allergy sub-specialty training. Click here for details. Cancer Research Institute Irvington Postdoctoral Fellowships. Supports postdoctoral fellows working in cancer immunology. Click here for details. Canadian Cancer Society Career Development Awards in Prevention. For postdoctoral fellows with at least one year of experience, working in the field of cancer prevention. This program has been placed on hold and no further applications are being accepted. Click here for details. Eppendorf & Science Prize for Neurobiology. A prize for one young scientist with the most outstanding neurobiological research in the past three years—targeted to more senior postdoctoral fellows and early career researchers. Click here for details. Juvenile Diabetes Research Foundation (JDRF) Postdoctoral Fellowships. Global fellowships to support research into type 1 diabetes. Click here for details. Brain Canada and NeuroDevNet Research Training Award. See details here. Komen Postdoctoral Fellowship Grants. To support postdoctoral fellows embarking on careers dedicated to breast cancer research. Click here for details. AAS Science & SciLifeLab Prize for Young Scientists. The Prize is awarded annually to one young scientist for outstanding life science research for which he/she was awarded a doctoral degree in the previous two years. Click here for details. Human Frontier Science Program Fellowship. Encourages early career scientists to broaden their research skills by moving into new areas of study while working in a new country. The HFSPO supports innovative basic research into fundamental biological problems, with an emphasis on novel, cross-disciplinary approaches. Click here for details. Multiple Sclerosis Society Postdoctoral Fellowships. Grants for promising recipients of MD or PhD or equivalent degrees with research relevant to MS. Click here for details. Department of Defense Postdoctoral Fellowships. The US Department of Defense offers several fellowships each year in various fields including ALS, prostate, breast, and lung cancer research. Click here for details. CIHR Banting Postdoctoral Fellowships. Provides funding to the very best postdoctoral applicants, both nationally and internationally, in the field of health research. Click here for details. Leukemia & Lymphoma Society Career Development Program. Supports postdoctoral fellows and early investigators in basic, clinical, or translational research to understand and treat blood cancers. Click here for details. NSERC Postdoctoral Fellowships. Provides funding to the very best postdoctoral applicants, both nationally and internationally, in the field of natural sciences and engineering. You must decide whether your research best fits CIHR or NSERC and apply to only one of these competitions. Click here for details. Canadian Breast Cancer Foundation Fellowship Program. The Fellowship Program supports research and/or academic or clinical training for graduate and post-graduate level scientists, physicians, and allied health professionals to pursue and develop expertise in breast cancer research and care. Click here for details. Cystic Fibrosis Foundation: Postdoctoral Research Fellowships. Click here for details. American Association for Cancer Research (AACR) – Basic Cancer Research Fellowship. Open to postdoctoral and clinical research fellows working at an academic, medical, or research institution who have completed their most recent doctoral degree or medical residency within the past three years at the start of the grant term. The research proposed for funding may be in any area of basic cancer research. Click here for details. Burroughs Wellcome Fund—Career Awards at the Scientific Interface. These awards provide $500,000 over five years to bridge advanced postdoctoral training and the first three years of faculty service for those moving from undergraduate and/or graduate work in STEM fields into postdoctoral work in biological sciences. Pre-proposals are due September 1st. For details click here. UofT Faculty of Arts and Science Fellowships. The Arts & Science Postdoctoral Fellowships are designed to provide outstanding recent doctoral students advanced training in their field of study. These fellowships are not discipline specific, but rather can be held in any department or research unit across the Faculty of Arts & Science at the University of Toronto. Click here for details. Finding $$Funding$$ with the Cos Pivot Database. Jennifer Tomaszczyk. June 2013. Tired of spending countless hours searching the internet for funding opportunities? Streamline your funding searches with the COS Pivot funding database! 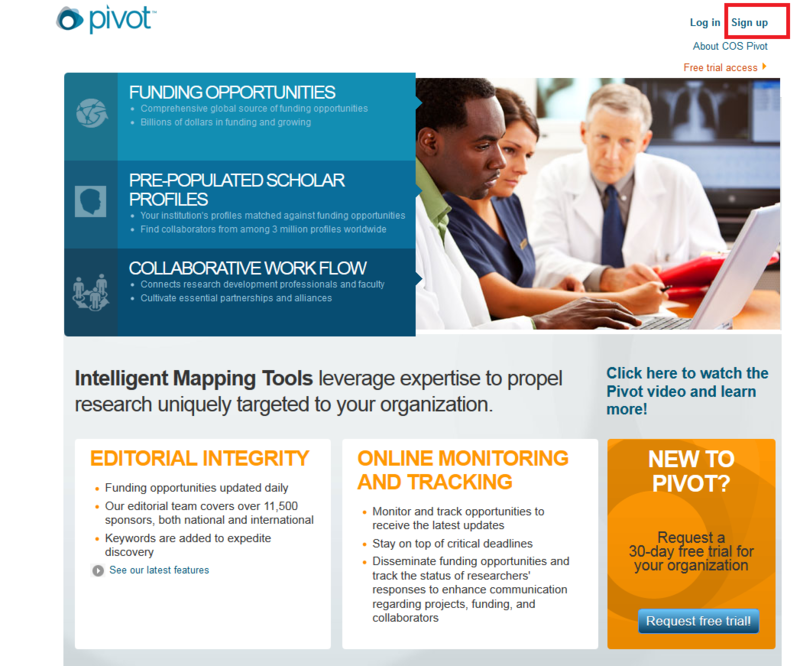 Pivot is a very large database of funding opportunities in all disciplines for students, postdocs, and PIs alike. Pivot is easy to use and makes searching highly efficient: it allows you to save your funding searches, and will automatically e-mail you new funding opportunities generated from your saved searches. Pivot can also remind you of upcoming application deadlines. Once you have created your account, go back to the Pivot page and click on Log in in the top right corner (click here to see Figure 2). This will bring you to your very own Pivot Homepage. From here you can conduct funding searches by typing search terms in the search box in the right-hand corner of the gray bar, near the top of the page. You will likely get a long list of funding opportunities or “opps”. To refine your search, go to the light blue bar to the left of the list of opportunities and click on the desired terms with which to filter your search. For instance, postdocs can filter their search to only return opportunities that have Top Requirements of PhD or MD or Other Professional, rather than opportunities that may be for graduate students. 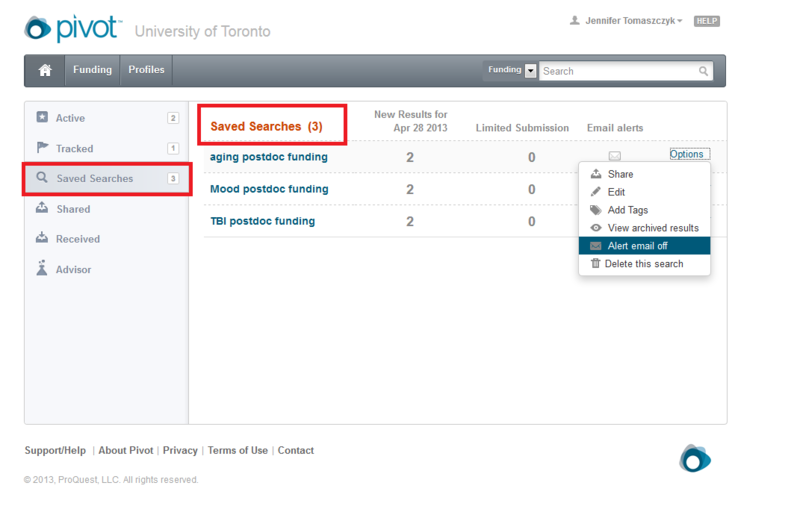 For more filtering options, click on Advanced Search in the Search Funding Results bar above the list of returned opportunities. Here, you can construct a more complex keyword search and filter by submission deadline, location, and more (click here to see Figure 3). 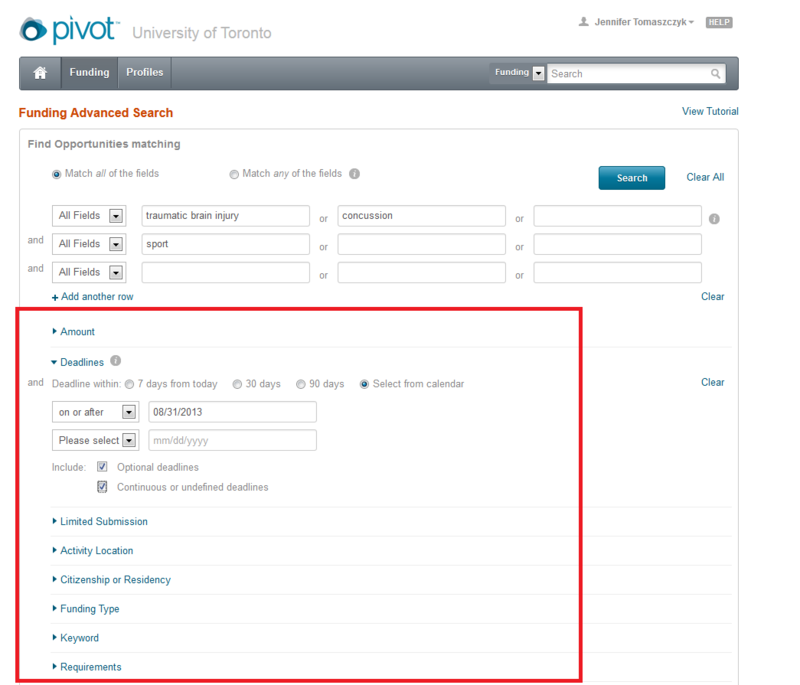 My favourite aspect of pivot is the ability to save funding searches and receive e-mail alerts when new funding opportunities that fit the search criteria are posted. 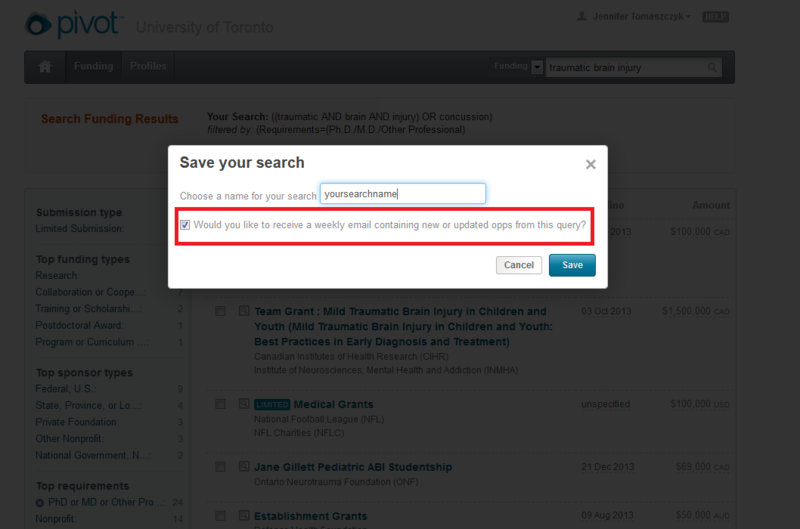 To save a search, click on Save Search in the Search Funding Results bar. You will be prompted to name your search, and asked whether you would like to automatically receive e-mail alerts for new funding opportunities generated by this search (click here to see Figure 4 and here for Figure 5). You can view your saved searches in the Saved Searches area of your homepage (click here to see Figure 6). Once you have refined your list to a more reasonable length, click on an opportunity of interest to view the full details—such as the website, eligibility requirements, application due date, etc. If you like what you see, you can choose to “track” the opportunity by clicking tracking (little flag) near the top right corner of the page. 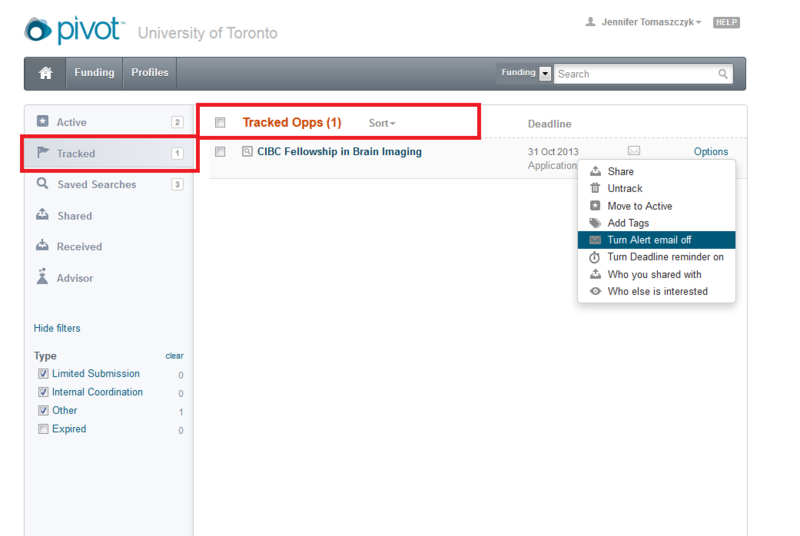 Tracking the opportunity means that it will show up in a list of “Tracked” opportunities on your homepage, and you will get e-mail alerts every time the opportunity is updated or when the deadline is approaching (click here to see Figure 7). Similarly, you can click on Active (box with star) to have the opportunity show up in the “Active” opportunities list on your homepage. Marking an opportunity as Tracked vs. 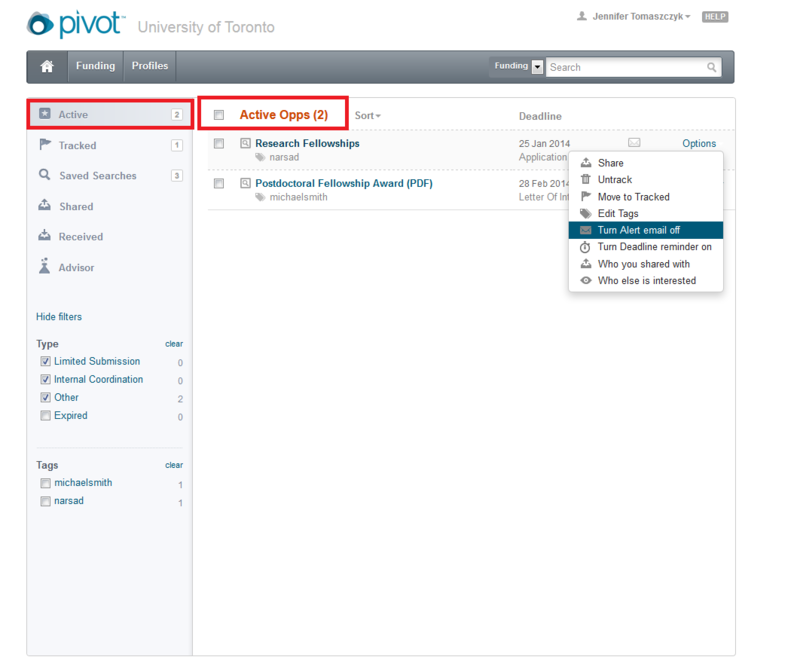 Active just determines which box the opportunity is displayed in on the homepage (click here to see Figure 8). You’re now on your way to conducting efficient funding searches! 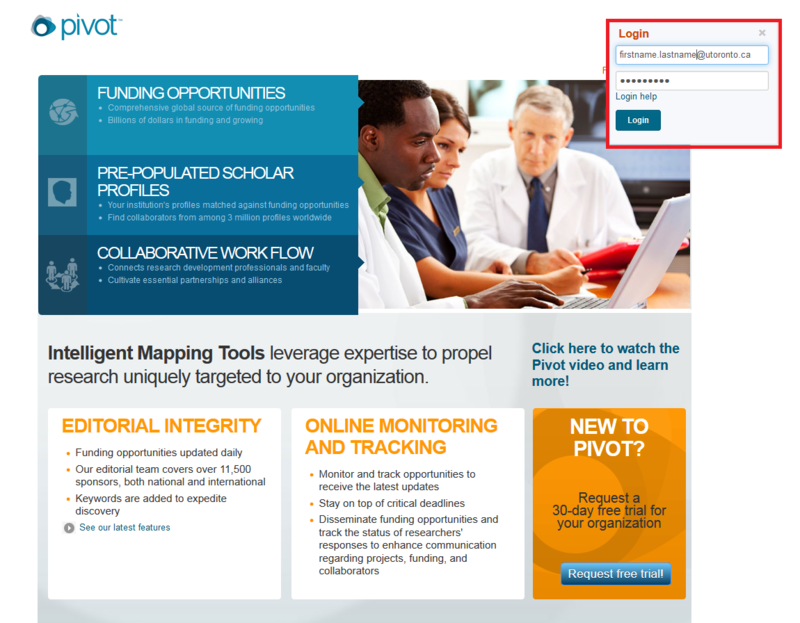 For additional help using Pivot or to discover Pivot’s other advanced options, visit https://pivot.desk.com/ or browse their Youtube help videos here http://www.youtube.com/user/ProQuestPivot. The ORT is committed to providing support and resources enabling trainees to achieve their full potential during their training at UHN and as they venture into the next steps of their careers. Graduate students should receive a library card automatically through their enrollment in a UofT department. Postdoctoral fellows however, will have to apply for one. If you are supervised by a scientist at UHN who holds a faculty appointment at UofT, you can apply for a library card and UTORid. First, ask your supervisor to write a letter of introduction on either their university department or UHN institute letterhead with the following information: your full name and birthdate, the start and end date of your appointment, your work address, and the name and address of your supervisor’s UofT department. Then, bring this letter and photo ID to the Reader Registration Desk on the first floor of Robarts Library (Ground Level, 130 St. George Street). If you are accepted by Reader Registration, you will be sent to the TCard office where a UTORid and TCard will be issued. Click here for more information. There are several resources available at the University of Toronto and within the community to help graduate students and postdoctoral fellows refine their written and oral English skills. Resources for Writing a Scientific Manuscript. Carrie-Lynn Keiski. September 2013. UHN welcomes qualified international candidates from all over the world! International student registration is handled through the University. International postdoctoral registration is handled mostly by the postdoctoral fellow themselves. This page will take you through the process and provide you with helpful information before and after you arrive in Toronto. Please note that the ORT strongly encourages you to determine what documents are necessary for working in Canada by speaking with immigration officers at the Canadian embassy in your home country. The information below is only a guide and may not include all of the processes surrounding your work permit. The following is a summary of the procedures that entitle you to work in Canada. When preparing to travel to Canada you must remember to bring several documents with you. These documents must stay with you at all times—not in your checked baggage! Postdoctoral research fellows are now considered to be employees that are paid via UHN payroll, thus they are eligible to enroll in the Inpatriate Health Plan (offered by HR and SunLife Financial). The Inpatriate Health Plan will support fellows during the 90-day waiting period for OHIP renewal. Refer to Citizenship and Immigration Canada (CIC) website for information on applying for a work permit or visa. If you are not a Canadian citizen or permanent resident, you must have a valid permit to legally work or study in Canada. Once you have been offered a position by a researcher at the UHN, you must obtain a Work Permit whether or not you will receive compensation from UHN. The current wait time to renew work permits is 132 days (see here for current wait times), or nearly five months. This means that, in order for a research fellow or scholar to have a renewed work permit in place by the time the old one expires, the application process must begin almost five months before the expiry of the current permit. Obtain a bank account of one of Canada’s major banks. See page, in the Daily Life Resources section of our website. Attend ORT’s Orientation. The new trainee orientation hosted by the ORT will provide you information on Research at UHN and provide you a hiring checklist and package surrounding your new hire. Your Supervisor’s administrative assistant will register you for the session. Attend mandatory training sessions. All trainees that are new to UHN must complete the following training sessions: Research Safety Training, Research Computing, Research Conduct, and other additional training subject to your role at UHN. Orientation and the Occupational Health Assessment.